Oh No, Ingrid - added link, thanks! Previous Heath Ledger as The Joker artwork. Click above to view larger oil painting of a happy and adorable baby. Click above to view larger Eight Belles artwork. I had previously painted a 4 by 6 inch miniature of Eight Belles, which acted as study for this larger 18 by 24 inch painting. 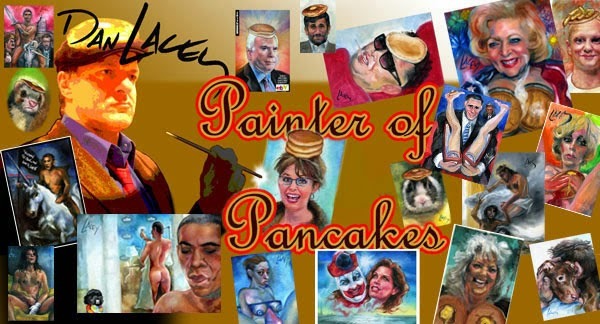 Click above to view larger Vladimir Putin artwork. A new painting of Russian Federation Prime Minister Vladimir Putin. By request. A rare pair of conjoined barn swallows were discovered in Arkansas. A veterinarian euthanized the surviving twin. Green Bay Packer's quarterback Brett Favre painted in the style of the Fauvists. Speculating that John McCain will pick Minnesota Governor Tim Pawlenty as Vice Presidential candidate and running mate on the 2008 Republican Presidential ticket. It would be an excellent choice. Pawlenty is well respected by liberals in MN; even if he can't help McCain pick up Minnesota he would impress the mass of undecideds throughout the midwest. An acrylic painting on 16 by 20 inch canvas of Chase the cat, the kitty without a face. By request. A very nice portrait of Republican Presidential candidate John McCain. 16 by 20 inch oil on stretched canvas. Sin controls desire using fantasy. This is an edited version of a mature-themed painting; you can view and purchase the original painting at the link below. This painting has been sold. Thanks! A Louisiana Republican Governor Bobby Jindal painting (in acrylic) by request. My most recent 'official' Barack Obama White House portrait, this time with a slice of coconut cream pie on his head. This portrait, along with a number of my other Barack Obama paintings are currently for bid on Ebay. Man steals Eucharist from Mass, is caught, then claims to receive death threats. Jesse Jackson threatens to neuter Barack Obama. Pinup artwork of Objectivist creator and influential author of The Fountainhead and Atlas Shrugged, Ayn Rand. Click above for larger Barack Obama pro-choice cartoon. Even larger Barack Obama kills the unborn cartoon. Former North Carolina Senator Jesse Helms dies on the Fourth Of July. A Fourth of July cartoon (larger). A request sketch, inspired by the Festival Express rockumentary which tells the tale of a group of 1960's rock icons traveling by train across Canada as part of a post Woodstock concert tour in the summer of 1970. In one scene, the train stops makes an unscheduled stop near a liquor store in Saskatoon. The film is worth seeing if only for the rediscovered footage of Janis Joplin, who died a few months later. Jerry Garcia sings 'Better Take Jesus' Hand' in Festival Express.